Darina Takova was born in Sofia, where she finished her studies at National Academy Pancho Vladigerov in the class of Prof. Mati Pinkas and Prof. Mila Dyulgerova. Takova has been a member of the National Opera for six seasons since 1989. During this period, she also performed at all national opera houses and concert halls in Bulgaria. She has won awards from Luisa Todi in Lisbon, Young Opera Singers in Sofia, Francesc Viñas Barcelona Totti Del Monte in Treviso. In 1992 she began an international active career on the world’s largest opera scenes Teatro alla Scala Milan, Teatro dell’opera di Roma, Florence, Bologna, Turin, Verona, Palermo, Trieste, Naples, Venice, Parma, Festival Rossini di Pesaro, Bergamo, Arena di Verona, Concertgebouw Amsterdam, Carnegie Hall in Nova York, Festival Barroc Innsbruck, Bayerische Staatsoper Munich, Deutsche Oper Berlin, Hamburgische Staatsoper, Oper Frankfurt, Opera of Ginebra and Lausana, Teatro Real de Madrid, Gran Teatre del Liceu Barcelona, Royal Opera House Covent Garden London, Opéra National Paris, Opéra de Monte-Carlo, National Theater Tokyo, Korea National Opera, Opera Canada, Los Angeles Opera House, Metropolitan Opera House New York, among others. In 1995 she sang the title role in Verdi’s Luisa Miller in Germany and Switzerland. After singing in a production of The Golden Cockerel in Rome she took part in the Rome Summer Festival as Gilda. At the Geneva Opera Theater she sang in Arabella and Rigoletto. In 1998 Takova made her debut at Teatro alla Scala as the Queen of the Night with Riccardo Muti conducting. This was followed by performances at La Scala in Donizetti’s Lucrecia Borgia with the famous production by Hugo de Ana. Additional appearances in Italy in 1998 included Lucia di Lammermoor in Florence and Violetta in Rome. In Lausanne she appeared in Ariadne auf Naxos and in Covent Garden in The Golden Cockerel. In the Covent Garden she also sang Violetta from La Traviata. Her debut in the United States was in 1997 where she sang in California and Detroit. After that become her debut at Metropolitan Opera House in New York withFaust by Gounod as Margherite in the great production of Hugo de Ana. Her most noted roles have been Violetta La Traviata, Semiramide, Lucia di Lammermoor, Lucrezia Borgia,Anna Bolena, Maria Stuarda, Königin der Nacht “Die Zauberflöte”, Amina “La Sonnambula”, Margherite “Faust”,Elvira “I Puritani”, among others. She wo rked with the greatest conductors of the time as Riccardo Muti, Alberto Zedda, Carlo Rizzi, VíctorPablo Pérez, among others. Takova sang together with international opera singers as Renato Bruson, Mariella Devia, Juan Diego Flórez,Ildebrando D’Arcangelo, Marco Berti, Daniella Barcellona, Michele Pertusi, Marcello Álvarez, Ruggiero Raimondi, Giuseppe Sabbatini, Nicola Marchesini, Boyko Tzvetanov, Laura Polverelli, among others. Since 2007 Takova started actively teaching by offering master classes and counseling to young opera singers from Bulgaria and abroad. 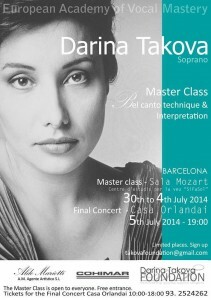 Since 2013 Takova has been a mentor of Operosa. 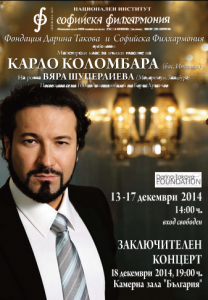 In 2007 created the Darina Takova Foundation located in Sofia, to promote young opera talents.